Despite decades of downsizing and shrinking workforce participation, there are 30 million well-paying jobs in the United States that do not require a bachelor’s degree, according to new research from workforce experts. That represents roughly one-quarter of America’s labor market. But those positions are increasingly concentrated in specific regions — and a high school diploma is often not a sufficient qualification to be hired for one, according to the study, a joint effort by Georgetown University’s Center on Education and the Workforce and J.P. Morgan Chase. “Good jobs that pay without a BA,” as the study dubs them, are divided between blue-collar work, often in labor-intensive trades, and “skilled-services” positions in industries like finance and health care. They typically require an associate’s degree, and their median annual salary is $55,000, enough to ensure something like a middle-class lifestyle in most of the U.S. The good news is that such jobs have grown by 3 million over the past quarter-century. The bad news is that their share of the overall job market has shrunk significantly over the same period: from 60 percent to 45 percent. 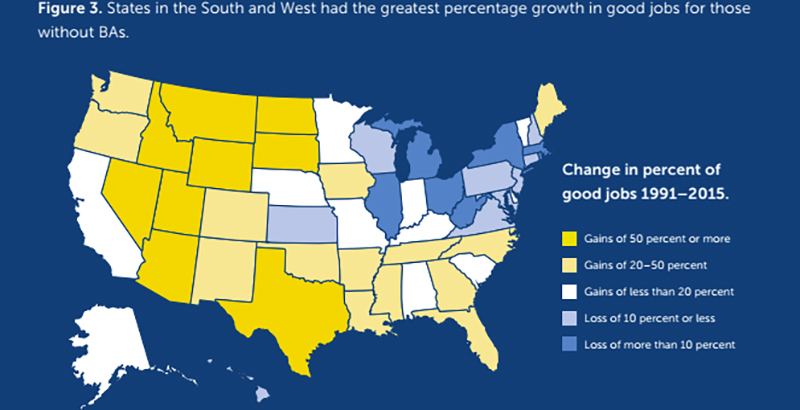 Growth has slowed parallel to the decline of the manufacturing economy: Although 23 states have added blue-collar jobs since 1991, they have been concentrated in industries like construction. The shuttering of America’s factories and mills, which became a noisy centerpiece of the 2016 election, accounts for 83 percent of the vanished middle-class jobs for workers without bachelor’s degrees, the report acknowledges. What remains of those jobs, whether blue-collar or more skilled, are clustered in the West, South, and upper Plains states. Driving south along I-95 from Boston would provide a tour of a region hemorrhaging opportunities. Of the 12 jurisdictions where well-paying blue-collar jobs have disappeared in industries even outside the battered manufacturing sector, the report said, eight are in the east (Massachusetts, Rhode Island, New York, New Jersey, Pennsylvania, Maryland, West Virginia, and the District of Columbia). Another two, Michigan and Wisconsin, aren’t far afield. Massachusetts presents a particular case in point. Along with New York and D.C., it is one of three jurisdictions — all of them highly educated — that have shed jobs since 1991 in both blue-collar and skilled-services industries. Meanwhile, its investment in workforce-preparation measures like career and technical education has been underwhelming in recent decades. The festering neglect of Boston’s flagship vocational school, which emerged as an issue for Mayor Martin Walsh in his successful bid for re-election this fall, typifies the state’s emphasis on college preparation over career readiness. Local observers say that choice has cost jobs even as it helped drive the state’s rise to academic excellence in the 1990s. Certifications, industry credentials, and two-year programs could be the answer, the authors suggest. Even as high school graduation rates have spiked in the past few years, the share of good jobs held by workers with only a diploma has fallen in 46 states. Highly desirable skilled-industry positions are increasingly being given to workers with associate’s degrees. “Associate’s degree holders have gained more than 3 million good jobs across the country since 1991. Associate’s degree holders held a larger share of good jobs in 2015 than in 1991 in every state,” they write.